Acknowledged as a major composer of guitar music Manuel María Ponce (1882-1948) it was nevertheless not high on the priorities of many guitarists to undertake recordings of his complete works, indeed Julian Bream never recorded any, although during the 1960's Bream did include 'The Folia de España' in his concert programmes. It was Ponce's collaboration with Andre Segovia during the 1920's, 30's and 40's that yielded the fine number of works in order to reinforce the maestro's repertoire of (for then) contemporary music for the guitar. 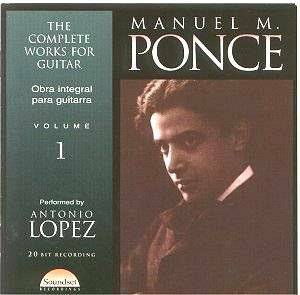 But now with this, the first of five discs covering Ponce's complete guitar works, and another set already underway by Naxos, and yet another available from Guitar Masters Records played by Gérard Abiton, recording of Ponce's music seems to be enjoying something of a revival. Although influenced by his country's popular music tradition, pieces like 'Cuatros Cancione Populares' and 'Sonata Mexicana' bear Manuel Ponce's unmistakable musical stamp, due to his individual harmonic sense. Ponce also delighted in writing a number of works mimicking composers of the past, Bach (the 'Weiss Suite'), Schubert ('Sonata Romantica'), and Fernando Sor ('The Sonata Clasica'), included on this disc, which although in the style of the great Catalan guitar composer is still undeniably Ponce. Guitarist Antonio López certainly demonstrates his ability in his interpretations of his fellow Mexican's compositions; the sonority of his tone used with subtle variation suit the music of Ponce perfectly (listen to 'Thème Varié et Final') getting the best out of it, even though there is rarely, if ever, in Ponce's works the type of show piece enabling the soloist to display dazzling feats of virtuosity, as there is, for instance, in the works of Barrios. The virtuosity is embedded within the music itself. Antonia López obviously knows this and is more than adequate for the task. One thing not in favour for this disc is its full price against Adam Holzman's playing of Ponce on the super budget Naxos label, nevertheless a fine recording from Sound Set Records. I look forward to Volume Two. The wide variety of music contained in these four discs from 'Soundset Recording' and the quality of the recorded sound should be applauded, the classical guitar being notoriously difficult to do justice to. Rather than settle on a 'house sound' it seems each recording has been tailored to the individual requirements of the artists and the music they are presenting, producers Todd Hallewell and Frank Koonce have done an excellent job.